Gaelaiche are the lightest members of the Celtic warrior class. Their spears are good against horsemen and their javelins can be used as a fine method to disorient a foe. Celtic warbands have always largely relied on spears. 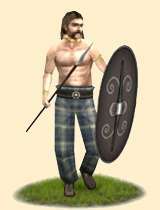 The Gaelaiche (Guy-latch; "Spear-Warriors") are the lightest members of the Celtic warrior class. They carry cheap equipment; Celtic longspears, javelins, and a shield. However, they have their uses. Their spears are good against horsemen, and can be used to good affect against infantry as well, and their javelins can be used as a fine method to disorient a foe. Experienced spearmen are a great asset to a campaigning Celtic army, and even inexperienced spearmen are generally superior to any early levies that can be produced. The many transalpine Gallic tribes arm themselves in this manner, but also a handful of tribes in southwest Britain also use such armaments and fighting style. Historically, Celts always favored spears; they were easy to produce and didn't require much steel. Celtic longspears were of fair quality, with broad, sharp heads that would cause deep, terrible gashes, and could be used as well to bring down horses. They would accompany these weapons with javelins thrown into an enemy position to disorient and kill a few foes. They would probably be mostly the youngest Celtlic warriors, but there wasn't shame in an older, experienced warrior fighting with a spear as well; the spear was a respected weapon in Celtic society.